DEAR VINCENT - Marco Beverage Systems Ltd. There was a general gushing about many innovations at Host, the beast of a trade show just concluded in Milan. While us Marco folk quietly glow with pleasure about our little corner of innovation, it is not this of which I speak. Weighing scales, particularly those sited in the drip trays of espresso machines were causing quite the fuss. Well, to be more accurate, amongst the 2% of the industry which is speciality coffee, a fuss was had. La Marzocco, the first to site weighing scales in an espresso machine, were present and correct at Out of the Box with the Strada, but swelling their ranks were Nuovo Simonelli’s Black Eagle and San Remo’s Opera. Amidst all the chatter, I heard not once a reference to a certain Mr. Vincent Fidele, whose innovation Extract Mojo not only introduced the concept of weighing espresso beverage as a quality reference, it also handed us a user friendly tool to enable that concept’s introduction to the mainstream. Well, to the mainstream may be a push. To the aforementioned 2% would be more accurate, the mainstream will follow. 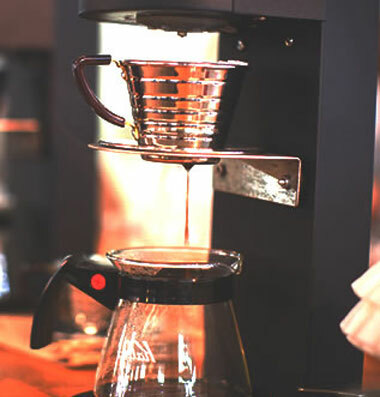 View Marco Beverage System’s range of coffee brewers, water boilers and other top of the range hot water systems online.